To film buffs, Arthur C. Clarke is best known as the author who collaborated with Stanley Kubrick to produce 2001: A Space Odyssey. The scientific community remembers him as the man who first conceptualized geosynchronous communication-satellite relays, in a 1945 paper that became the foundation for modern communications technology. But science-fiction fans have any number of touchstones for the British author: He's one of very few to be designated a Science Fiction Grand Master, he's the author of the classic novels Childhood's End and Rendezvous With Rama, and he first created the popular axiom "Any sufficiently advanced technology is indistinguishable from magick." Now in his late 80s, Clarke has written or collaborated on more than 70 books, including three 2001 sequels, three Rendezvous With Rama sequels (co-authored with Gentry Lee), two autobiographies, and a wide variety of essays and short stories. His non-fiction includes collections of his correspondence with C.S. Lewis and Lord Dunsany, as well as many books on physics, science, and space travel, from 1950's guidebook Interplanetary Flight to 1994's The Snows Of Olympus, a graphic look at a terraformed Mars. His latest, Time's Eye, is a new collaboration with Stephen Baxter, the first in a series of novels involving a cataclysm that slices Earth into segments from across history, leading cosmonauts and prehistoric humans to mix in an epic struggle. From his home in Sri Lanka, Clarke recently spoke with The Onion A.V. Club about religion, transcendence, the possibility of life on Mars, and the dinosaur that was named after him. The Onion: How long have you lived in Sri Lanka? 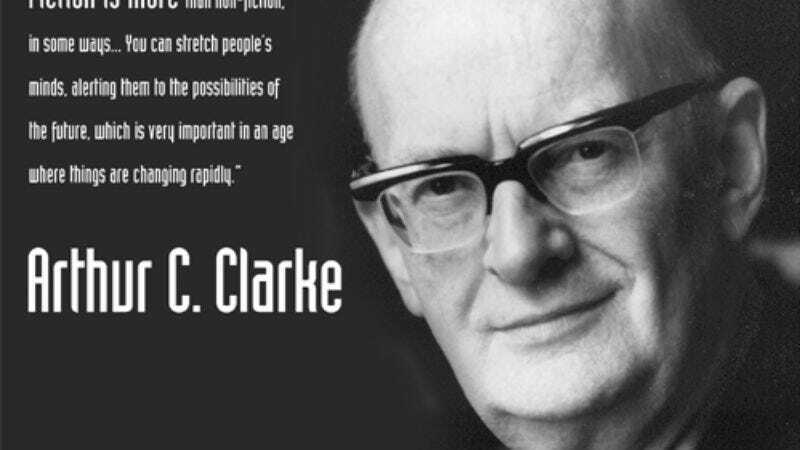 Arthur C. Clarke: Oh, about half a century. I actually never left Britain until I was in my 30s or 40s. O: Do you ever go back to visit? Have you been back since your knighting? ACC: Yes, I've been back, but I don't know if I'll ever go back again. In fact, my sister, I just said goodbye to her. She stayed here for a few days, but she's leaving tonight, so there goes another link with England. O: How did you originally come to move to Sri Lanka? ACC: Well, I went to Australia to visit the Great Barrier Reef when I got involved in scuba diving, and on the way, I stopped at Colombo and met the local divers. They said, "Why don't you come back after you've dealt with Australia?" And that's just what I did. I wrote my book on the Great Barrier Reef, and then I came back here with my late partner, Mark Wilson, to do a book on Sri Lanka. He married one of the local beauties, and we just sort of settled down here. O: What appealed to you about the country? ACC: The quick answer I give to people who ask me about Sri Lanka is "30 English winters." [Laughs.] So it's a beautiful country. Historically, very interesting in every respect. Very nice people. All of my friends are here now. O: How does living there affect the collaborations you do? ACC: I think it probably helps. I wrote an article some time ago called "Co-Authors And Other Nuisances." And with e-mail, now, you see, you can get all the exchange you want. O: How did you first get started with Time's Eye? ACC: Well, I'm not quite sure. It's quite a while ago. I'm now in the middle of… I've dug into another book, called The Last Theorem. The beginning of Time's Eye was probably arranged by my killer agent. I can't remember if Stephen Baxter and I had ever had any contact before. It was quite a ways back. O: Is that usual for you with collaborations? Someone else sets them up for you? ACC: Well, I've only done a few collaborations. One of them with a guy called Stanley Kubrick. O: What was that working relationship like? O: Have you seen the movie recently at all? ACC: No. I want to look at it again, and also 2010, which I did with [director] Peter Hyams, and which was also quite good. I can't remember when I did last see it. O: Did you have any idea when you were working on it that so many of the elements would become such pop-culture icons? ACC: No, I don't think we could possibly have done that. The monolith, of course, is an example—the endless jokes about that, and about HAL. But I'm quite happy that people remember it. I hope it inspires them to go buy my other books. O: Are you ever disappointed that we haven't come any closer to the technology of 2001 than we have? ACC: Not really, because we've already seen far more… For instance, these pictures coming from Mars right now. I never imagined… Well, I may have imagined, but I never hoped to see them within my lifetime. O: Do you have any particular hopes for what they'll find in this round of exploration? O: Since you started your writing career, what technological innovation has most surprised you? ACC: Well, of course, inventing the communications satellite was the most important contribution to everything. O: What about the changes in science fiction over the same time period? ACC: Well, science fiction, when I started reading it in 1930, was mostly bug-eyed monsters threatening nubile maidens. Of course, it's much more sophisticated now. But I'm afraid I don't have time to read it. I've really read no current science fiction. O: Do you watch science-fiction movies, or TV programs? ACC: I certainly do, when I can get hold of them. Of course, I can't get hold of everything. I just got Lord Of The Rings, incidentally. I knew Tolkien slightly, and C.S. Lewis much better, and I'm very glad that Lord Of The Rings has done so well. I haven't had a chance to see it yet, but I hear they did a wonderful job. O: What first motivated you to write science fiction? What interested you in the genre? ACC: Fiction is more than non-fiction, in some ways. You can create a universe of your own. You can stretch people's minds, alerting them to the possibilities of the future, which is very important in an age where things are changing rapidly. O: The Rudyard Kipling epigram for Time's Eye seems very moralistic. Do you think of the book as having a specific moral? ACC: I guess every book has a moral, in some ways. Time's Eye has got several different morals. But I guess the most important one is, "Don't mess up the environment until you're quite sure what you're doing." O: Do you intentionally write your books around morals? ACC: Not intentionally. I'm quite fond of the writer who told a beginning author, "If you've got a message, use Western Union." ACC: No, no, I've changed my mind. I think they're industrial accidents. O: So you believe fairly strongly that there's intelligent, active life out there somewhere? ACC: Well, of course, there isn't any evidence. But it seems incredible to suggest that in this enormous universe, we are the only intelligent life form. I'm very fond of the quote—I don't know who said it first—"The best proof that there's intelligent life in the universe is that it hasn't come here." Now, on Mars, we may have detected life, but not intelligent life. Of course, there's lots of rumors that the Pentagon already has it and is sitting on it, but I don't think that's very likely. O: Another favorite quote you tend to bring up in interviews is, "If there are any gods whose chief concern is man, they can't be very important gods." Can you expound on that? ACC: [Laughs.] Well, I was rather a cynic once. But now I've combined all my beliefs into this phrase I've been circulating: "Religion is the most malevolent of all mind viruses." It's adapted from a phrase by the British writer and scientist Richard Dawkins, who said that religion was a mind virus, an idea that infected the mind. He said that not all mind-viruses are malignant; some may even be beneficial. But many are harmful—racist theories, for instance. O: With that quote, are you talking about religion's harm to the individual, or harm to society? ACC: Well, look at history: religious wars, the Inquisition, the Crusades. What more do you need? It could be both, though. O: Your writing—particularly the 2001 series and Childhood's End—contains a strong ongoing theme about the transcendence of humanity, about the idea of mankind moving beyond the limits of the physical body. Is this something you actually hope to see happen at some point? ACC: I think it's probable that as we develop, we'll move our minds into our machines. We're becoming computers anyway. [Laughs.] You could experience anything, be anywhere, you see. Get an infinite number of real universes as well as imaginary universes. O: Should we be worried about what we could lose in the process, as well as what we're going to gain? ACC: Well, there's a price for everything. What was it Oscar Wilde said? "Someone who knows the price of everything knows the value of nothing." Some things have eternal value, and compassion is one of them. I hope we never lose that. Compassion for humans as well as animals. I've been very involved recently with attempts to save the whales. Incidentally, have you heard about the discovery of the largest living creature on Earth? Would you believe it's two or three miles across, and probably several thousand years old, and still growing? It's this fungus that's eating Oregon. It's a single creature. I'm not quite sure how that's determined. ACC: Oh, yes. I've got Discover magazine on the desk in front of me at the moment. Occasionally, I'm surprised at some technological development, and the realization that any sufficiently advanced technology is indistinguishable from magic. I think the CD-ROM is the best example of that. The idea of having a whole symphony, or opera, or novel in a little piece of plastic is pretty amazing. O: You've had an asteroid named after you, as well as a writing award and a satellite. And, of course, you've been knighted and nominated for the Nobel Peace Prize. Are there any other honors you aspire to? O: What's your current project? You mentioned you're writing a book called The Last Theorem. ACC: Well, I'm glad you asked me that, Senator. [Laughs.] It's a novel about Fermat's Theorem. For 300 years, nobody's been able to find a proof to it, and only about 10 years ago, a young British mathematician named Andrew Wiles did manage to prove it. But here's the mystery: Wiles' proof goes about 100 pages, right over my head. Fermat himself wrote that he had a wonderful proof, but that it was too long to go in the margin. [Fermat's Last Theorem was found jotted in the margin of a copy of Arithmetica, a reproduction of an ancient Greek mathematical text. —ed.] Now, whether he did have a short proof, or whether he kidded himself, we'll never know. But my book is about a young Sri Lankan who does discover a short proof to Fermat. O: To what end? Where does the book go from there? ACC: Well, he's instantly snapped up by the CIA, because prime numbers are very useful in cryptography. I haven't written much of it yet, though. O: Some critics have said that Childhood's End is your best book, or your most significant, and in some interviews, you've sounded displeased with that opinion. Is there another book of yours that you think stands out more strongly? ACC: No, I'm not at all displeased. They may be right. Of course, it was written 50 years ago, and I've written many other books since. Usually, my latest book is my favorite. Right now, it's The Fountains Of Paradise, which I'm hoping will be filmed shortly. O: Do you have any interest in being closely involved again with a film adaptation of your work? ACC: After working with Stanley Kubrick for a couple of years, anything else would be an anticlimax.